New Orleans Mayor Mitch Landrieu issued an official welcome this week to Operation Save America, an anti-abortion organization that interrupted an Uptown church’s prayer service with its protests on Sunday and had plans to parade the alleged remains of a fetus around Jackson Square in the French Quarter. The group’s protest efforts have been focused on site of the future Planned Parenthood clinic on South Claiborne Avenue, but on Sunday, they took a different turn when members showed up inside the First Unitarian Universalist Church at Claiborne and Jefferson. The disturbance took place as the congregation was holding a moment of silence for a member of the church who had died the week before, said the Rev. Deanna Vandiver. [She] was not home but the message was left. Saints lined her neighborhood streets with signs that revealed the violence of abortion, leafleted the neighborhood to warn the neighborhood that a serial killer was in their midst. At the church, Vandiver said she found it “deeply troubling” that the mayor of New Orleans would issue any sort of endorsement to the tactics being employed by Operation Save America against the city’s residents. The resident near the protest site, however, interpreted the mayor’s welcome to the group as a political move. On Monday afternoon, a petition at Change.org was gathering signatures asking Landrieu to rescind his welcome to the group. Perhaps when Westboro comes to town, also exercising their “constitutional rights”, Landrieu can throw them a ticker tape parade. I wonder if Mitch realizes that Operation Rescue and the Army of God (several of the attendees are associated with the latter as well) are considered hate groups by a wide variety of human rights organizations. Boy when you add this to Landrieu’s adamant refusal to recognise the 40th anniversary of the Upstairs Lounge Fire earlier this year, it sure makes you wonder where he stands in regard to hate groups and their beliefs. A group protecting babies is a hate group? Wow. When people infiltrate and disrupt another faith’s house of worship and call it a “synagogue of Satan” I have no problem describing them as a hate group. However you feel about abortion, these people are hateful. They claim to protect fetuses. Babies they don’t give a crap about. That doesn’t make sense. Probably a reference to the fact that being against a forced governmentt welfare nanny state is tantamount to harming children. Obviously the opposite is true in reality. If you’ve ever seen a 3D ultrasound of a “fetus”, you would probably feel some shame. Perhaps if you’ve ever gotten to really know and respect a woman who felt that abortion was the right choice for her or a woman whose life depended upon the difficult decision of ending a pregnancy, you would feel some shame yourself. It is the tactics used to achieve a goal, not necessarily the stated beliefs of the group, which makes any organization a hate group. If your objective and practice is to disrupt legal activities, terrorize people in their homes and be disruptive in their church services, etc., the tactics you use and the way you present yourself (sometimes in ADDITION to your stated purpose) qualify a hate group. So if your organization obeys the law, protests and prays outside an abortion clinic and does not harrass, accost, assault or batter people attempting to enter, nor do you interfere with access to the clinic, you are simply protesting. Following the doctor home, laying siege to their home and terrorizing their family and accosting their neighbors is another matter entirely. I saw that in the news, and I’m in Baton Rouge now. I was shocked. I vividly remember that fire. I was a teenager and a man in our neighborhood was one of the victims. It was an horrific act of terrorism. BTW, I properly call it the Upstairs Lounge Arson and Mass Murder. Because that’s what it was. Did he issue a certificate thanking them for terrorising the residents of Fountainbleau all weekend just because a doctor lives there? These people are domestic terrorists. I’d appreciate the Mayor addressing this huge gaffe immediately. It appears that Mitch has forgotten who his voting base is. Selling his soul for his upcoming Governors bid, Mitch the Sell-Out strikes again! SMDH!!! Couldn’t it also just be the kind of “shut up” that sounds like “thank you for your opinion” during polite conversation? They view it as validation of their cause and sanctioning of their tactics. The Mayor’s office could have easily avoided this merely by not acknowledging them. It is the job of the Mayor to keep his passive aggressiveness in check. It’s a civil rights issue, so as long as it’s non-violent and respects property, there’s nothing wrong with a little rowdiness and civil disobedience. That’s how you get things done in this world, as the left surely knows. You apparently missed the part about them disrupting a church service, at the very least infringing on the constitutional rights of others. There is indeed something wrong with that. But that’s how you marginalize others, as the right surely knows. There is nothing respectful of others or their property rights when you enter a church during a church service, disrupt their mourning for a passed congregant, and terrorize the congregation in their own house of worship. They should have been arrested and jailed. And where was the NOPD on Sunday when this happened? I don’t think you read the article fully. It’s not about their right to protest. 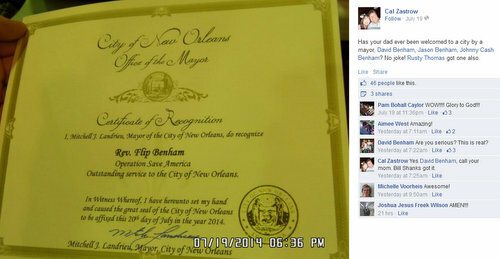 It’s about the Mayor’s office THANKING THEM FOR THEIR “SERVICE” TO THE CITY OF NEW ORLEANS. Frankly, even if it were about their right to protest, I could see placing restrictions on actions which prey upon the vulnerability of others. Protests don’t belong at funerals; they don’t belong at religious services, daycares, hospital recovery rooms…. When we see protests in these places, they are far less about communicating information, and far more about inflicting psychological harm for the sake of inflicting psychological harm. Westboro is the worst example of this. Protestors should be offered publicly accessible space, but at the point at which they are harassing vulnerable populations, like the grieving, or the ill, there should be some limit. Is it ok that these cowardly hatemongers held up pictures of aborted fetuses outside of a class window for young children to be terrorized by? This is a hate group plain an simple. They don’t do what they do for anyone else than themselves and the feeling of superiority it gives them in the otherwise meaningless and pathetic lives. God forbid people see the reality and horror of abortion. Killing unborn babies is what is pathetic. Stalking? Are you kidding me? These people are like the dinner guest that starts a fight or argument at the dinner table. A UU sanctuary is a welcoming space but that being said ,a certain decorum should be shown in respect of this space . I’d like to see Landrieu sign an invoice billing these idiots for the tens of thousands of dollars in NOPD coverage, security, and city services the taxpayers are being forced to expend on their “outstanding services to the city of New Orleans”! Great policy. We need to send TONS of back invoices to every loony left wing protest in the last 50 years. The revenue would be incredible!! Heck, let’s charge people millions to protest. That would be great for the 1st amendment. From the other side of the religio-political spectrum, I whole-heartedly agree with your sentiment. We should not be expected to pay for the everyday exercise of our civil liberties. Let’s remember that these sort of “awards” are routine, and really mean very little in the grand scheme of things. I do not blame the Mayor’s Office for issuing the certificate. What matters now is whether the Mayor will stand up in light of the despicable tactics this group is using in order to get their way. Revoking the certificate would at least send a public message that their behavior is not appreciated. thanks for this article. nobody in the nola media holds this mayor accountable for anything. the police force is shrinking and demoralized, the crime rate is not improving, chief serpas has presided over known corruption, city streets are worse than ever and continuing to get worse, street lights are out all over, the insane inequity between residential and commercial and non profit property tax continues, the s&w board is run like a school picnic committee, the list goes on, and all this at a time when the city has never been so financially buoyant. when does the “at-least-he’s-not-nagin” period end? This ‘church’ group / terrorist group is creepy and disruptive. Be sure that Mitch was brainwashed in the catholic dogma and cannot or refuses to embrace the thought that the vatican has no proof of a heaven, hell or god. And the brainwashed masses are an easy segment of the population to lead around, lie to and get votes from. I am proud of Deanna for standing up to these rude and pathetic trolls. He just wants to be governor in a red state. You can’t do that by standing on the side of common people and defending them against the assault from the conservative terrorist machine that runs rampant in this country. they view everything as validation though. Being escorted out of a church was somehow validation that theyre true saints and the UU church was somehow physically oppressing them. Mitch should be more careful about who he hands out certificates to, though. God bless these people who make a stand for the babies of our country. They are innocent victims of this country’s moral decay. I salute them & the 1st amendment which allows them to express their beliefs. Planned Parenthood could stop dealing in abortion tomorrow & they would never see another protest. Life is the answer, not death. New Orleans has enough bloodshed. Regardless of your beliefs, you do NOT actually have a right to enter someone else’s property to declare those beliefs. That’s not what the First Amendment protects. Ignorance may be bliss, but you’re still dumb. I agree that they should not have done that unless invited in to debate. Dealing in abortion? Two bits says you can’t describe any other services provided by Planned Parenthood, nor can you suggest any other facility that provides said services. Love your image there. A murdering Communist who stole millions of homes & farms from people & who wanted to lob nuclear bombs at the USA. You’re a great poster child for your cause of death. People always resort to ad hominem attacks when they can’t answer the argument. I take it you didn’t get the joke in that image? Since you don’t even get the pun in my avatar, I’m pretty damn sure you don’t get much else. And it was Russia that wanted to “lob nuclear bombs”, you twit. Che and Fidel were willing accomplices in antagonizing Kennedy. Oh. Sorry. I know you prefer to stick to revisionist history. Please, by all means, go back to your 6,000 year history of the earth. Nope you’re wrong. Read up. I’ve read multiple books on this useful idiot from every different political angle. He is quoted & confirmed from various witnesses. Your buddy was a terrorist, thief, commie, & murderer. He murdered & jailed family members of personal friends. Wow, you are ignorant. Is Mao one of your heroes too? That would be fitting since he used forced abortion as a tool of suppression. You’re still evading the issue and throwing up smoke screens. The graphic is a joke. Touche. No? Too stuck up your own arse to get it. Talk about a tool of suppression. Ok. To answer your question. Yes, I think some of planned parenthood’s services are good, but one “service” is so reprehensible that it invalidates all good services. It’s like defending Castro…man, crime is low in Cuba & he pays for everyone’s education. Well, the fact that he runs a country as a gulag w no individual rights kinds of invalidates anything that can be perceived as good. Same w planned parenthood. Just because they do a free mammogram doesn’t validate the killing of human beings that can’t defend themselves. I would suggest you’re a tool of suppression. Or at least a tool. But you still avoid actually answering the question, as well as just not have a sense of humor regarding the avatar. Which service works best for you? And do you provide doughnuts after the sermon? Rev Flip is a lier. He told me he disagreed with the invasion of the protesters in our UU Church Sunday. He said this wasn’t the way to get people to listen to their message. He is sociopath and a snake. I called the mayor’s office at (504)-658-4900 to express my disappointment and to demand that Mitch rescind this proclamation. As an attendee at 1st UUNO, a constituent and a former volunteer and paid canvasser for Mayor Landrieu’s reelection campaign, I feel doubly hurt and offended. There is so much wrong with all of this, but the one thing that just cracks me up is that these people self-describe as “saints”. Egotistical much? The New Testament use of the term “saints” just refers to any believer. I’m sorry that you didn’t know that. Upon googling I see that varies from sect to sect. I see now that your definition is in line with how Protestants use it. It is not universal however. These are believers. They’re zealots who conveniently adapt the Christ’s teachings to suit their purpose. Do they always give criminals these awards? Someone wasn’t thinking. Flip Benham himself admits he’s been arrested “between 50 and 100 times”. No doubt BS but he proclaimed it. Would the Mayor also issue a proclamation to the KKK or a neo Nazi group? Give me a break. It is not necessary, nor should it be customary, for the Mayor to welcome all who come to our city, irrespective of their intent and demonstrated past history. This group has caused, and will continue to cause considerable harm to the Mayor’s constituents, done out of hatred, not love. It really upsets me to think that this group can now brandish and “endorsement” from our Mayor. Sorry but all I hear when I read this is Pennsatucky, from Orange is the New Black, spouting off from betwixt her missing teeth hatred and judgment. I suppose anyone who enjoys that kind of immoral programming will also surely burn in the fires of damnation along with the Unitarians and Planned Parenthood employees. “I’m not crazy, I’m chosen!” Come on New Orleans get it together! These folks are trying to force their beliefs on Americans. I’m glad to have a discussion, maybe even an argument or debate, but to violate others like they did the Unitarians and the doctor is crossing the line. How are these “Christians” different from the ISSI fundamentalist Muslims that are forcing people in Iraq to convert to Islam? I don’t agree w/ anyone marching in another “church” & disrupting the proceedings but how is a 1st amendment protest force? It seems that our nanny state forcing taxpayers to fund Planned Parenthood & its death machine force. They should not receive one dollar from the American taxpayer. Our “nanny state” forces taxpayers to fund all kinds of things they personally abhor. I myself do not like the level of spending on the military, and i feel we spend too much on roads and not enough on mass transit. Should we defund those things because a minority of taxpayers feel a moral repugnance? I am fine with fully-funded national health care, including contraception and abortion services paid though taxes. If you do not like abortion, don’t have one. If I do not like military spending, I can fight the political fight that would get that reduced, as you can on abortion. But I do not see why YOUR moral compunctions should get such deference form the government where mine are discounted. Let’s all pay our taxes and decide in the political arena what for. I agree that our defense spending is too high, but at least it’s constitutional to raise an army for common defense. The other things you promote such as nationalized healthcare has no basis in our constitution. If you want to change the constitution to become a full-on socialist state, it can be done but it hasn’t yet so these taxpayer funded boondoggles are illegal in my opinion. “Life liberty & the pursuit of happiness”…I guess only if you are an adult. so domestic terrorists are now heros? wow. It is obvious that both this terrorist group and the mayor are profoundly opposed to the US Constitution, especially the first amendment. As a UU myself, I will understand if this congregation does not take this terrorist group to court, but would recommend they do to stop religious terrorism. Since terrorism is killing innocent people in pursuit of a political goal, Planned Parenthood fits the definition much more. Actually that is not the definition of terrorism. I hope this helps. I am not sure how abortion would be in pursuit of a political goal either. Although, I don’t personally believe that a fetus is a child, I do understand how believing that a fetus is a child would elicit a strong response to abortion. If they are truly concerned about the life of a child why don’t they help spread love to the life of a child that is already born. I would suggest embracing one of the children in need that are caught in the current crisis at the Mexican/American border. There are plenty of very young children there, that are in need of love, and help. I am specifically speaking of the ones that are to young to know about, or be involved in the political disagreement about the situation. I agree that every child should be loved & supported. So is a baby in the womb the day before they are born a baby to you? When is your cut off? When do YOU decide that a fetus is a baby? When they have a heart beat? When they can survive outside the womb? Or a week AFTER they are born? (Some people actually believe this last part) Very sad that our country is this far from God in 2014…& science for that matter. The Democrat mayor probably simply made a mistake, but feel free to stay angry and harass the guy and not vote for him so that his eyes can be opened to just how much his own party hates white men. Disgusting behavior. Isn’t bullying supposed to be illegal. I cannot believe this Mayor. Horrible. This is a war between established Christianity (and Judaism and Islam) versus the new gay agenda, which the agendists started. The Christians are simply pushing back now. Yep, ’cause Christians have no history of being pushy before this. I like the term “agendists,” by the way. it has a good conspiratorialisticish kind of ring to it. I’d rather be “pushy” towards saving life than ending it any day. This isn’t my America. Protesting against a church? Inside of another church proclaiming that its ‘satanic’? And in the south? I guess no one remembers the 60’s at all. :/ The last time I heard anyone pulling this kind of stunt everyone who was engaged in it was arrested and thrown in jail for local, state and federal violations of the law. Not reading much but ‘its a Catholic city’ here. I don’t see this going well unless its addressed quickly and properly. The radical fundamental theocratic misogynist cultists ARE anti-American haters of freedom and liberty. They are vicious seditionists who are attacking the inalienable civil, human and Constitutional rights of innocent female US citizens to privacy, bodily autonomy, and reproductive justice. There is a difference between pro-birth and pro-life. These people have no interest in pro-life. These are the same people that once these children are born, don’t want them fed, clothed or educated. If they want to be pro-life, they need to reevaluate what “life” and “pro” really are and what they mean. Furthermore, the bible is riddled with references to G-d aborting fetuses and ripping children from the womb. So even there own g-d, violates there own tenants. Will they condemn G-d to Satan too? I would have suggested a percussion piece, played with Louisville Sluggers. Evil. Who are the violent people again? Maybe “fantasized” a percussion piece? I initially thought more prosaically of bloody noses, but what the congregants did do was the best thing: lead the disturbed people gently from their sanctuary to some place where they could get the help of kindly mental health professionals. We no longer beat the mentally ill in this country. What evidence do we have that this funeral was not just a hoax? Neither aborted nor miscarried fetuses are released, even to a parent, without documentation. Whether you call it medical waste or human remains, you can’t just make off with it, and it absolutely does not end up in trash cans behind a clinic. Most fetuses that die before 20 weeks are cremated, sometimes at the hospital. After 20 weeks, a funeral home often has to be involved, depending on how pushy the funeral industry in your state is. As for all these alleged photos of aborted babies, I’ve been seeing the same images for 30 years, but never seen any evidence of who/where/when/ exactly what these images are supposed to represent. We might as well be looking at “alien autopsy” photos. All of their imagery is faked. So I guess the babies’ deaths are faked too? They never existed? The Mayor is a member of that longest-operating “Hate Group” of all, the Catholic Church. Who do the Landrieus think they’re kidding? They are :Baggers in blue dog suits. It is offensive that the Mayor sees fir not only to tolerate,, but to validate social terrorists. When the neo-nazis come to town will Mitch trick out in his jackboots? It’s tough enough being stranded on this tiny island of blue in the vast sea of red, but to be betrayed by Mayor Gilligan is intolerable. Choice is also a Constitutional right. The pictures that pro-lifers display are not at all representative of the vast majority of abortions. The bloody horrors they subject people to are either miscarriages or extreme cases normally only done when the life of the mother is at risk. But I guess a picture of a tiny gray thing that you can hold on one fingertip doesn’t have the same shock value. The sheer mendacity and viciousness of the pro-life movement seriously undermines their credibility. The Bible says the homosexuality is an abomination and how any Christian can embrace abortion is a mystery to me. Whatever this “pastor” is teaching, it is NOT Christianity. The Bible says Satan is a masterful liar and this lady leading this church is doing Satan’s work, much to his delight. Do those of your household trim their beards? Eat shellfish? Wear linen and wool in the same clothing? Have tattoos? Take communion right after giving birth? If they do, then there is some heavy duty hypocrisy goin’ on. ‘Cause those are not only forbidden by the Lord, they are proscribed in the same section (Leviticus) as the one forbidding the lying of men with men. Can’t cherry-pick the word of God.